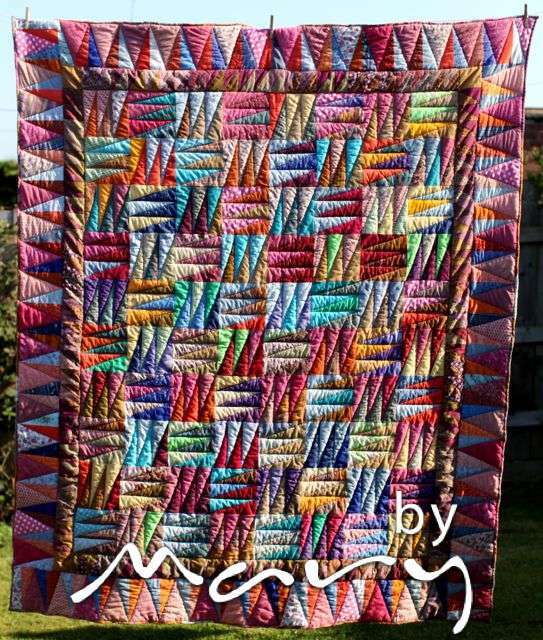 Many years ago my mum was given a book of knitted garments by Kaffe Fassett, I think it must have been Glorious Knitting (published in 1987), I remember being amazed at his incredible use of colour and pattern, I could look at the book for hours. Years later (writing this makes me feel really old!) 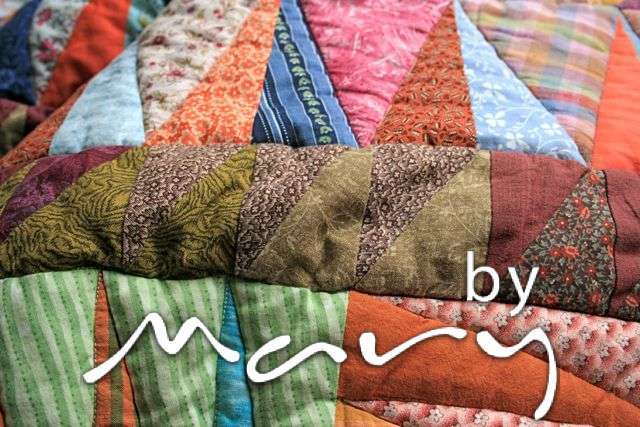 I was delighted to find that the clever man had turned his hand to patchwork, the first book of his that I came across was Patchwork and I bought the book and dreamt about making quilts and finding the right fabrics somewhere, somehow. 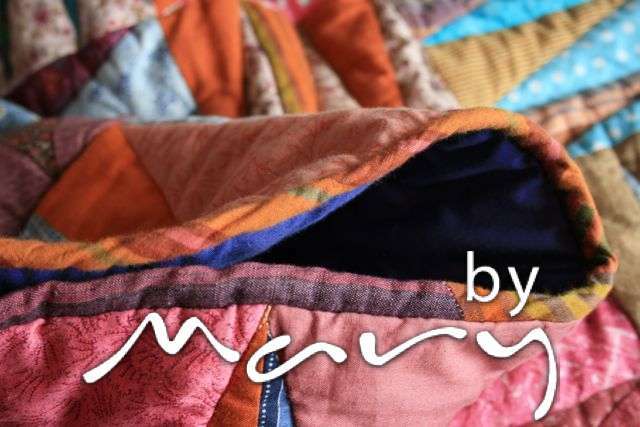 Maybe I’ve got better at searching or maybe there really is a much better selection of fabric more easily available now, but I remember trying to find the right fabrics for this quilt that I desperately wanted to make and struggling so much. I’m fairly sure that I started making it while we lived in London, it was a long, slow process not just because of the difficulty in sourcing fabrics but also the fact that time, space and motivation were possibly lacking. I really got to grips with it when we bought our first house, I remember evenings laying out the pieces all over the floor in our living room and then sitting on the stairs trying to get a better view of how it might look when assembled (we had an open plan living room/stairs area I’m not completely crazy! ), then moving pieces around and having another look. It probably didn’t help that Kaffe writes about pinning it on a board and having a special tool which did the opposite of magnifying so he could see how it would look, so I was just trying to do the same but without a studio or special tool to work with! 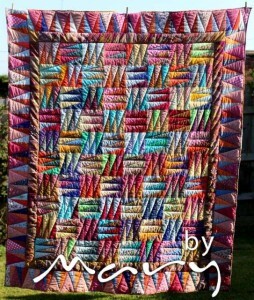 It did take a long time to make but it was a lot of fun except the selection of fabrics, I was so desperate when it came to the outer border, made up of pink, blue and orange. Could I find any orange fabrics? It was incredibly difficult. This quilt it on our bed and often the girls look at the fabrics and try and find pieces that match, this is one that they call carrots, I’m fairly sure they are chilli’s, they are not as straight as carrots (I know carrots aren’t always straight) and they have tops like chilli’s not carrots. Anyway it’s really what I would call a novelty print and not something I would usually go for but I was desperate! 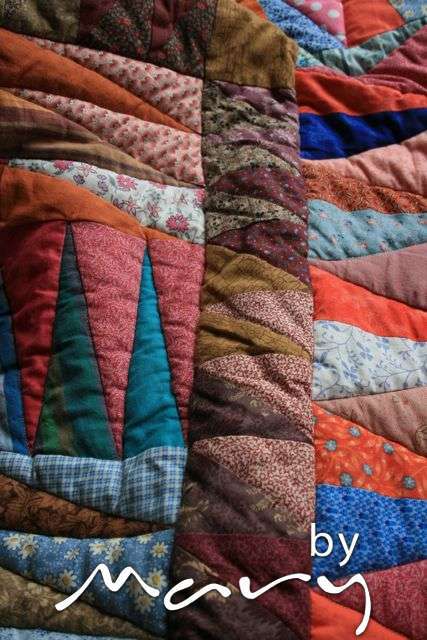 The quilt design is called pennants and as you could probably guess from that title it is made up of triangles of different sizes. It makes sewing fun, most of it was done with paper piecing which is something I’d not done before but it really helps with accuracy, I don’t think it would have been so precise without the paper! The photos above don’t quite show how bright and colourful this quilt is but it is and one I’m really quite proud of. I did use a lot of fabrics that had been handed down as well as bought fabrics so I feel it is a mixture of vintage and new. I now feel that I ought to label it for future generations (now there is a scary thought!). Oh and by the by I’ve just looked on his website to see he’s doing some workshops this year in Cornwall! « Some lovely gifts for me! It is great – I love it, the trick is get a book and follow the instructions! It really is simple! Ok maybe not that is why this series will go on for years with maybe a few years break while I finish one that was started 3 years or more ago! Wow, that’s beautiful. You’re amazing. 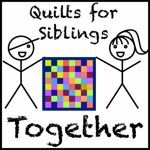 Thanks Cathy, I’ve just had a browse through your site – your quilt making is superb! 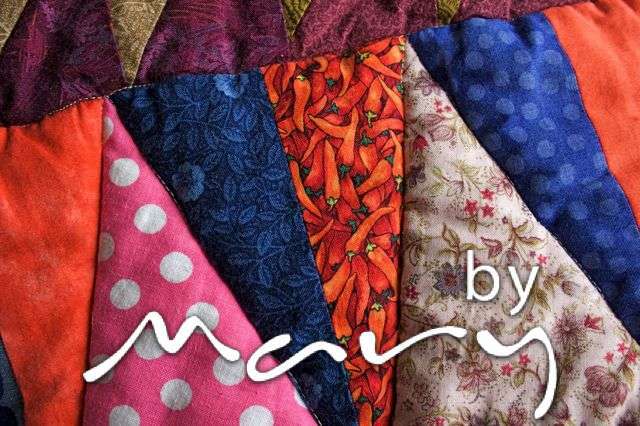 Watch this space for another Kaffe quilt soon – well I’m currently working on it and feel like I’m over the tough bit of inset seams!